Adventurer George Kourounis and his group of storm-chasers were barreling down an empty highway near the town of McCool, Nebraska, when heavy grey skies formed above them. They spotted a tornado in the distance, and they were hellbent on heading toward it. Then, without warning, a second tornado formed in the field next to them, and it was rapidly heading in their direction. At this point, there was nothing to do but to take evasive action. To prevent the vehicle from flipping, Kourounis turns the minibus into the wind, and the angry storm throws a crop sprayer straight into the front of his vehicle. The riders in the backseat gasp and shriek — they also have their iPhones held upright, ready to capture every exhilarating second on camera. These folks aren’t your ordinary Helen Hunt and Bill Paxton tornado-chaser-types. While most people prefer to spend their summer vacation lounging at the beach, this particular crew paid to spend their PTO chasing tornados in the Midwest. This is what it’s like to be on a week-long storm-chasing tour. Yes, that’s a type of tourism that exists now. And it’s become increasingly popular amongst crazy, thrill-seeking vacationers. If you’re interested in living out your “Twister” fantasy, there are now dozens of travel firms offering tours that aim to take ordinary travelers into the thick of the action. Here’s everything you need to know. Tornado Alley attracts the vast majority of enthusiasts (duh). The area includes Oklahoma, Texas, Kansas, Nebraska and parts of Colorado, Wyoming, Arkansas, Missouri, Iowa, New Mexico and South Dakota. Tornados are common in this region, where cold, dry air from Canada and the Rockies meets warm, moist air from the Gulf of Mexico and hot, dry air from the Sonoran Desert. The combination causes atmospheric instability and intense weather events. The peak season for storm chasing in Tornado Alley is May and June, but some companies also operate tours in April, July and August. Extreme Tornado Tours: Extreme Tornado Tours was founded by Dr. Reed Timmer of the Discovery Channel hit “Storm Chasers.” Tours run April through June and will cost you between $2,700-$3,600 per person. Cloud 9 Tours: Cloud 9 Tours was established in 1996, making them the oldest storm chase tour company in operation. Its tours cost $2,900 per person, and they start and finish in Oklahoma City. Storm Chasing Adventure Tours: This one is already getting booked up through 2018. Starting points are Denver or Oklahoma, and fees hover around $2,600. The intimate tours of six people are helmed by professional storm chasers. These guys are typically climatologists or severe weather meteorologists—some of them from the National Weather Service — so, they know their stuff. Each morning, these experts analyze forecast models and other weather data to predict the best severe weather target area for the day. They refine the target as the day goes on, using new information obtained from on-board weather radar and tracking software. 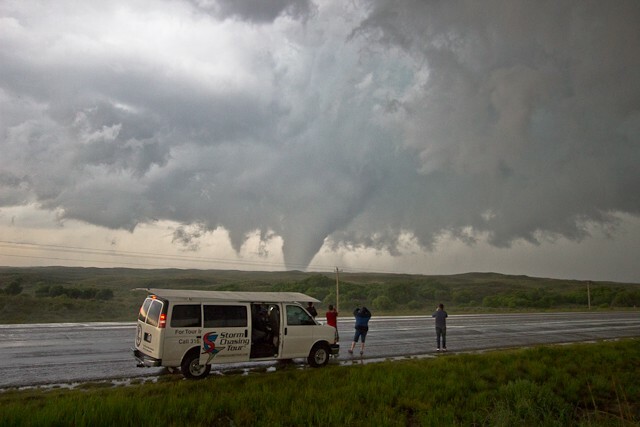 Because safety is the top priority, the guides position the vans anywhere from a few miles to one mile away from a tornado, depending on the individual storm and road options. Their real-time weather radar and years of experience help them get tourists close to tornadoes without compromising their safety. According to Extreme Tornado Tours, the biggest danger isn’t even the storms — it’s the time spent on the highways driving alongside other storm-chasing vans. Each tour experiences dramatic supercell thunderstorms (which are responsible for most of the tornadoes that drop). But, for obvious reasons, they can’t guarantee you’ll actually see a tornado. During inactive severe weather regimes, the tours typically diverge to local state and national parks. This is probably the only time you’ll be upset you didn’t have bad weather on your vacation. Can’t swing the money or the fees? Consider the next best thing — you can watch tours in real-time on this handy live stream. We Finally Did Something Good For The Environment!